The 1805 Club was founded in 1990 to preserve and care for the memorials and graves of those associated with the sailing navy of the Georgian era. They are a vital yet often neglected part of Britain’s naval heritage. No other organisation is dedicated to their preservation. Preserve graves, monuments and memorials relating to seafaring people of the Georgian era and in particular the Royal Navy during the French Revolutionary and Napoleonic Wars and Admiral Lord Nelson. Promote and publish research into the Royal Navy of the Georgian period (1714–1837). New and unique to this website are the Muster Book datasets funded by the Chancellor using LIBOR funds. Organise cultural and historical events for the enjoyment and edification of our membership and the public in general. Since 1990 the Club has conserved 65 graves and memorials in the UK and overseas, created three new memorials, arranged high profile commemorative events with the Royal Navy, furthered research through international conferences and its publications, notably the annual Trafalgar Chronicle and Nelson’s Band of Brothers: Lives and Memorials and launched an educational programme for schools. It has become an important member of the naval heritage family. 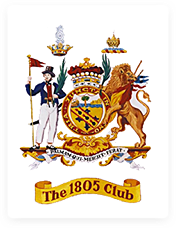 The 1805 Club is also the official custodian of The Trafalgar Way from Falmouth to the Old Admiralty in London and has recently been awarded Libor funds by the Chancellor to further its activities. 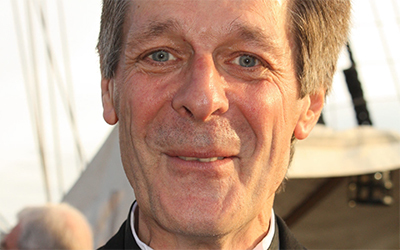 It is with deep sadness we announce the death of our Chairman, Peter Warwick. Regular updates from The 1805 Club’s Chairman. See the archive. Click here to read The 1805 Club’s latest Press Release. To find out more and to become a Topman, please click here. See why others have joined our international membership. Join today! A Membership Leaflet is available for you to print out. The 1805 Club and Milford-on-Sea Historical Record Society have arranged a major ceremony for Admiral Cornwallis in July 2019. To read Cornwallis Remembered 1819 - 2019 please go their Home Page and scroll down. Peter Warwick describes the Club’s remarkable discovery of a unique uniform and artefacts from the Trafalgar period. Visit Admiral Lord Nelson's own blog www.admiralnelson.org. The 1805 Club frequently sells items relating to the club.